The nuclear-powered ships of the Northern Fleet operate from five naval bases on the Kola Peninsula: Zapadnaya Litsa, Vidyaevo, Gadzhievo, Severomorsk and Gremikha. Some of these bases also have additional facilities such that there is a total of seven base sites for operational nuclear vessels. There are land-based storage facilities for spent fuel assemblies at two of these bases. Solid and liquid radioactive waste are stored at six of the bases. Furthermore, there are a number of technical service ships containing spent fuel assemblies and solid or liquid radioactive waste that serve the naval bases and shipyards. These service ships are described in Chapter 3. In addition, considerable amounts of radioactive waste have been stored at Kola Peninsula shipyards and in Severodvinsk. The nuclear submarines taken out of service are located at these shipyards. The shipyards are described in Chapter 5. In the following we will briefly examine the development of the naval bases and the generation of radioactive waste and spent nuclear fuel, and give a short description of each of the naval bases. When we describe the bases, the number and classes of the nuclear submarines that are normally stationed at the base, are given. The numbers may vary over time, since the submarines often change bases at the completion of a tour of duty. The two primary reasons for the construction of naval bases on the Kola Peninsula were the proximity to the Atlantic Ocean and the country's need for access to ice-free harbours. Most of the area bases were built after the Second World War, and during the Cold War, the development and construction of nuclear submarines and various missile systems received the highest priority. However, the development of infrastructure at the bases along with service functions and shipyards for the nuclear submarines lagged behind the rate at which the vessels themselves and their immediate requirements were being built. Often there was a lapse of five to eight years from the time that the new submarines were launched before technical facilities for the servicing and maintenance of these vessels were ready for use. The first nuclear submarine of the Soviet Northern Fleet (K-3) was launched in 1958, yet the first facilities for the handling of radioactive waste and spent nuclear fuel were not ready for use until the early 1960s. Also the later classes have had such problems. At the Nerpichya naval base, a number of the docking facilities for the Typhoon class submarines remain incomplete, for the cranes which were to have been built at the pier were never erected. Yet the first Typhoon class submarine was launched in 1981. A number of facilities for the handling and treatment of radioactive waste exist on the drawing board, and construction was started on many of them. However, many of these projects were never completed. At Andreeva Bay, construction was started on a facility for the processing of liquid radioactive waste, but the work was never completed. In another instance, a loading facility for spent nuclear fuel intended for the same base never proceeded beyond the planning stage. The safe handling and treatment of radioactive waste is not highly prioritised, and this is reflected in the lack of technical and economic resources that are earmarked specifically for this purpose. The facilities that actually have been built have been financed with whatever funds remained once the operational Navy forces had been served. The location of the respective bases was determined by the pertinent military authorities, whereas the actual decision to build any given base was adopted by resolution in the Central Committee of the Communist Party and by the government. Timely completion of a particular facility was more important to the Central Committee in Moscow than the standard of the buildings and the quality of the equipment. The naval bases on the Kola Peninsula were built by military personnel who lacked the skills and competence necessary to construct sound and solid buildings in the hard climatic conditions of the north. The personnel were poorly trained for the task at hand and a low level of discipline was reflected in the poor quality of the buildings that the military building battalions erected. Conscripts who were not qualified to serve in the fighting forces were transferred to working on military construction projects. The commissions responsible for approving the various projects at the bases were largely military commissions, and the commanding officer's chief responsibility was to ensure that deadlines for the construction projects were met. Under these conditions, it is plain that concern for the environment or the safety of the population was not of high priority. In the beginning there were no defined limits to confine possibly harmful consequences to the environment posed by the various nuclear facilities and storage areas. Nor were there any set limits to the amount of radiation workers at the facilities might be exposed to. The future possibility of having to dismantle nuclear submarines and clear up the storage areas was never considered. The introduction of simple radiation safety rules was but a small improvement. Rules with respect to public health and other standard documents were kept secret and remained unavailable to both the public and the pertinent monitoring agencies. Local authorities were never informed of activities taking place inside the naval bases and nuclear submarine yards. To this day, the Russian state radiation protection authority ( Gosatomnadzor ) is denied access to information about the activities of the Northern Fleet. In 1994, an attempt was made to open up the naval bases so that civilian monitoring agencies could evaluate radiation safety. This was accomplished when President Boris Yeltsin signed a decree assigning Gosatomnadzor the responsibility to monitor radiation safety at the naval bases. Despite the President's instructions, the navy refused to allow representatives from Gosatomnadzor to enter the naval bases. 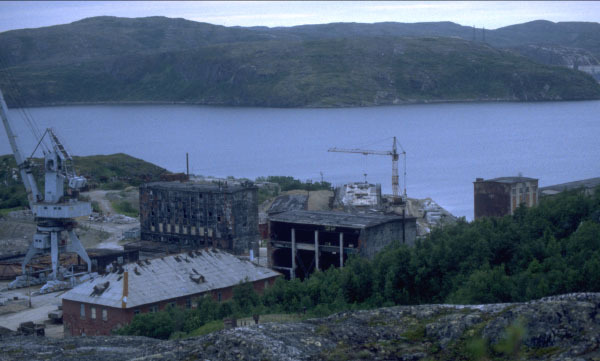 In 1993, the Northern Fleet denied a request of the local Committee on the Environment in Murmansk for information on the storage of radioactive waste at the naval bases on the Kola Peninsula. In spring 1995, the committee was permitted to visit the facilities at Andreeva Bay. At present, the Ministry of Defence has direct responsibility for control of the storage of spent nuclear fuel and radioactive waste at the naval bases and installations. It is clear that those who built the nuclear submarines and established the processing facilities for radioactive waste were unable to foresee the magnitude of the problems that would arise with respect to the storage of radioactive waste and the decommissioning of nuclear submarines. The use, maintenance and decommissioning of nuclear reactors generate radioactive waste which in turn must be processed, transported and stored. During normal operation, radioactive waste and spent nuclear fuel are generated largely during the refuelling of the submarine reactors. Earlier Russian submarines were generally refuelled after a period of seven to ten years of service, depending on the enrichment of 235U and the use of the reactor. Nowadays the Russian nuclear submarines are refuelled after three to five years of operation. Since the 1980s, spent nuclear fuel has been removed from some of the Northern Fleet's laid up submarines. Earlier the reactors was refuelled while the submarines was in dry-dock. In recent years it has become common practice to refuel the reactors while the submarines are floating between a pier and one of the service ships for spent nuclear fuel. Refuelling operations are both time consuming and hazardous. Russian submarine reactors are left to cool for a minimum of 90 days after shutdown before work to remove the spent nuclear fuel begins. The operation to remove the fuel takes about one month, while it takes two to three months to place fresh fuel in the reactor and ready reactor for operation. The process of changing fuel in a reactor starts by cutting away the part of the hull that covers the reactor. Some remedial action is taken to prevent release of radioactive dust. The primary cooling circuit is disconnected, and the fuel assemblies are lifted out singly. The service ship derricks are used for this operation. The fuel assemblies are placed in special metal containers and hoisted to the service ship holds. When all the assemblies are removed, overhaul and repair of the reactor is carried out. New fuel assemblies are inserted, and the primary cooling circuits are filled with new coolant. The reactor lid is fastened, and the removed section of the hull is welded into place. About 10 m³ of high level liquid radioactive waste are generated during refuelling operations. In addition, solid wastes are generated such as control rods, tailings from the reactor tank and other equipment that has been contaminated during work. The replacement of various reactor filters leads to the generation of about 1 m³ of highly radioactive ion exchange sorbent. The procedure results in an accumulation of 2-3 m³ of liquid radioactive waste. The larger reactor parts, that are exchanged during refuelling, must also be regarded as radioactive waste. Under normal circumstances, a refuelling operation generates between 155 to 200 m³ waste. Removal of the spent fuel assemblies from the reactors and transfer to storage compartments on board the Northern Fleet type 326 service ship Severka , and at a later date, to type 2020 ships in the Malina class. Temporary storage of the spent fuel assemblies on board these service ships. Eventual transport to land-based storage facilities owned by the Northern Fleet at Andreeva Bay (formerly also at Gremikha). Temporary storage of the spent fuel assemblies at these facilities for three years. Transfer of the fuel assemblies back to Northern Fleet service ships for transport to naval shipyard No. 35 Sevmorput at Rosta in Murmansk. The fuel assemblies are then conveyed to the adjacent railway yards and transported to Sevmorput. Re-loading of the fuel assemblies into transport containers for forwarding to Mayak. Storage and eventual reprocessing at Mayak. There is a considerable amount of transport of spent fuel assemblies between the various naval bases on the Kola Peninsula. Transport procedures and handling of spent nuclear fuel is discussed more fully in Chapter 7. Presently somewhat in excess of 7.000 m³ liquid, low to medium activity waste, with a total activity of 3,7 TBq (100 Ci) is stored at Northern Fleet naval bases and yards. In addition comes the high activity waste. Liquid waste is stored in floating tanks, in tanks on shore and aboard service ships and tenders. The yearly production of liquid waste is between 2.000-2.500 m³. Since all storage capacity on the Kola peninsula is full, the situation has become acute. Some liquid waste is taken to be processed the Atomflot treatment plant in the Murmansk fjord. In 1994 the Northern Fleet delivered 1.000 m³ here and in 1995, 200 m³. Even if Atomflot treatment capacity should increase, the Northern Fleet will have difficulty in footing the bill for treatment and transport. There is now approximately 8.000 m³ of solid nuclear waste of low to medium activity in storage at Northern Fleet bases and yards. Total activity for the waste is about 37 TBq (1000 Ci). The solid waste is stored in concrete installations, on ships and in the open. The yearly production of solid waste is about 1.000 m³. The annual waste production will increase significantly as decommissioning gathers momentum. The Northern Fleet has no installations for the treatment of solid waste. Those types of waste which could have been burnt or compressed are now occupying an undue amount of storage space. The storage of control rods from submarine reactors is of great concern. The rods, made of a boron-europium alloy, are used for controlling reactor output. They are renewed simultaneously with the fuel elements. Used control rods are highly radioactive, but they are stored together with low to medium activity solid waste. At the present time, several thousand such rods are stored in Northern Fleet bases and yards. It is hardly possible to perform a risk assessment of the various vessels and installations of the Northern Fleet on the basis of the information that is presented in this report. A serious assessment of the risk of accidents occurring at the nuclear installations or of leaks from the storage facilities would require a thorough technical examination of the facilities under discussion as well as knowledge about how they are operated. The previous chapters have described the various naval bases and focused on presenting an overview of the actual number of nuclear submarines and the amount of radioactive waste and spent nuclear fuel that they generate. Risk of uncontrolled chain reactions. This applies to operational nuclear submarines, decommissioned submarines whose nuclear fuel remains in the reactor, as well as storage facilities, storage ships and railroad containers holding spent nuclear fuel. It is in these kinds of accidents that the risk of releasing significant amounts of radioactivity over a large area is greatest. Danger of leaks of radioactivity from sources other than an uncontrolled chain reaction. This concerns potential leaks from submarine reactors, storage facilities for solid and liquid radioactive waste, transport ships, trains or lorries, as well as storage facilities for spent nuclear fuel. There are a number of possible causes of both uncontrolled chain reactions and radioactive leaks. The principal reasons include technical failure, fire, explosion, human error, wear and seismic or climatic incidents. A complete risk evaluation requires that all of these points are taken into account. The table below presents an overview of the items at the Northern Fleet naval bases that represent a nuclear safety risk. Table 6: The objects at the Northern Fleet naval bases that represent a nuclear safety risk. Zapadnaya Litsa is the largest and most important Russian naval base for nuclear-powered submarines. The base is located on the Litsa Fjord at the westernmost point of the Kola Peninsula, about 45 kilometres from the Norwegian border. The Litsa Fjord heads into the Kola interior from the Motovsky Fjord, just across from the south-eastern coast of the Rybachky Peninsula. The residential city for the naval base facilities is called Zaozersk and is located six kilometres east of the inner reaches of the Litsa Fjord. Up until the beginning of the 1980s, the town was known as Severomorsk-7. 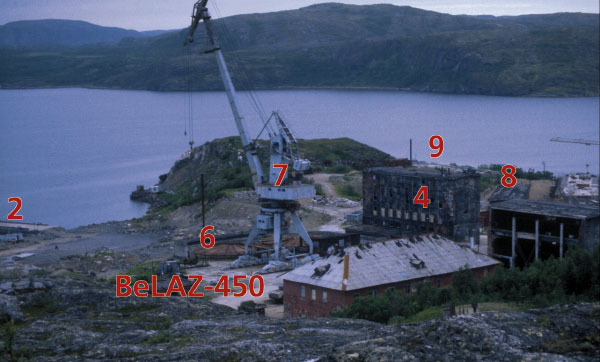 It has also been called Murmansk-150 and Zaozerny. 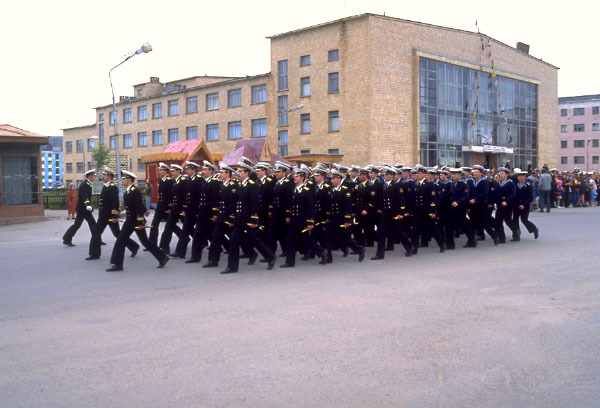 Zaozersk has a population of about 30 000, most of whom are navy personnel and their families. Construction of the town was started in 1959 at the same as the first naval facilities were built. The road to Zapadnaya Litsa turns off from the highway between Murmansk and Nikel a few kilometres west of the River Litsa. Construction of a railroad track to the base was begun in the 1980s but never completed; however, the line does reach Nerpichya where the Typhoon class submarines are based. This satellite photograph of Zapanaya Litsa was taken in 1989. The Northern Fleet's largest intermediate storage facility for spent nuclear fuel may be seen on the western side of the fjord in Andreeva Bay. The three base facilities for nuclear submarines are also shown on the eastern side of the fjord. Zaozersk and the surrounding agricultural area may be seen to the right in the picture. Due to copyright restraints this photograph is only available in the printed version. The printed version can be ordered from us. There are four naval facilities at Zapadnaya Litsa: Malaya Lopatka, Bolshaya Lopatka, Nerpichya and Andreeva Bay. Zapadnaya Litsa was expanded considerably towards the end of the 1970s and at the beginning of the 1980s. The total length of the base quays is 20 600 metres. Traditionally, the newest submarines have been deployed to Zapadnaya Litsa as soon as they are commissioned, and included among them are both attack submarines, strategic submarines and tactical submarines. The three Soviet research submarines of respectively, type 645 (K-27), type 661 - Papa class (K-162), and type 685 - Mike class (K-278 Komsomolets ) have also been stationed here. Zaozersk is a naval base town at Zapadnaya Litsa that is closed to the public. The town has about 30.000 inhabitants, most of whom are submarine crew and other military personnel along with their families. Malaya Lopatka was the first base facility to be built at Zapadnaya Litsa at the end of the 1950s. From the summer of 1958, the Soviet Union's first nuclear submarine, K-3, was stationed here. During the following year, the first group of nuclear submarines consisting of K-5, K-8, and K-14 was based at Malaya Lopatka. At the end of the 1950s, Academician Aleksandrov was at Malaya Lopatka to personally direct the sea trials of the nuclear reactors for the first nuclear submarines. Construction of the pier facilities was completed at Bolshaya Lopatka (another naval facility two kilometres further into the fjord) during the first half of the 1960s, and the nuclear submarines were subsequently transferred there. Malaya Lopatka was then used as a repair base, and today there are also five piers and a floating repair workshop here. Bolshaya Lopatka was the second base facility to be built at Zapadnaya Litsa and is situated two kilometres further down the fjord. Most of the present day nuclear-powered submarines are stationed here. There also used to be some first generation nuclear submarines at this base, but now all of the vessels are of the second or third generation. There is a total of 32 operational submarines based at Bolshaya Lopatka plus two decommissioned submarines of type 705 - Alfa class (K-493 and K-373). The nuclear fuel of K-373 remains on board in the submarine's reactor. A third submarine of this type, K-123, also based at Bolshaya Lopatka, is still in operation. Other submarines at the base include two nuclear submarines of type 949-Oscar-I class (K-525 and K-206) and six vessels of type 949 A-Oscar II class (K-148, K-119, K-410, K-266, K-186 and K-141). There are also nine nuclear submarines of type 671 RTM-Victor-III class. At least 11 submarines of type 671 R-Victor-I class and type 671 RT-Victor-II class are based at Bolshaya Lopatka, and the Northern Fleet's four nuclear submarines of the type 945 - Sierra class ( Barracuda, Condor, Carp (K-239), and Crab , K-276)  are also normally stationed here. Barracuda is presently in the docks at the Sevmash shipyard in Severodvinsk where it is being rebuilt following its collision on February 11, 1992 with the American nuclear submarine Baton Rouge just off Kildin Island near the Kola coast. Nuclear submarines of the Victor, Alfa and Oscar classes are stationed at the base facility in Bolshaya Lopatka. This facility is located on the eastern side of the Litsa Fjord, directly across from Andreeva Bay. Bolshaya Lopatka also has 8 piers and a floating dock to service and repair nuclear submarines. The radiation protection authorities take samples of the water in the submarine reactor's primary circuit, and there is also a storage facility for sources of ionising radiation at this base. There is an additional smaller storage facility for the solid and liquid radioactive waste that is generated during the process of checking the cooling water. Once this intermediate storage area is filled, the waste is transferred to the large storage facility in Andreeva Bay right across from Bolshaya Lopatka on the other side of the Litsa Fjord. At this storage there is about 2 m³ solid radioactive waste. Nerpichya, located at the inner reaches of the Litsa Fjord, is the newest of the Zapadnaya Litsa base facilities. The first pier facilities were ready for use by the end of the 1960s. When the base facility was opened, it served as a base for nuclear submarines of type 675-Echo-II class, and later, for submarines of type 658-Hotel class. In 1977, all of the nuclear submarines were transferred to other naval bases on the Kola Peninsula, as Nerpichya was to be modified to become the naval base facility for the new giant 175 meter-long type 941 nuclear submarines-Typhoon class. Construction on the first submarine in this class was started in 1977. In the period from 1977 to 1981, the base facilities at Nerpichya were expanded to include three large piers and a number of new facilities on shore. However, despite the fact that the new nuclear submarines were to be based at Nerpichya, many of the new facilities were never completed. For example many of the parts necessary to complete a larger facility for external supply of energy to the submarines never arrived at Zapadnaya Litsa. Many of the cranes planned for the three new piers were never erected. Presently there are six nuclear submarines of the type 941 Typhoon class (TK-208, TK-202, TK-12, TK-13, TK-17 and TK-20 based at Nerpichya. The three piers at which the submarines are moored are located beneath a steep mountain. In the early 1980s, there was a rock slide here which destroyed a number of buildings all the way down to the piers. Nerpichya lies in the innermost reaches of the Litsa Fjord. The base facility also has a dry dock which is used for carrying out repairs on the Typhoon class submarines. There is also a smaller, temporary storage area for solid and liquid radioactive waste. There are six Typhoon class nuclear submarines stationed at these three piers in Nerpichya. Each vessel carries 200 strategic nuclear warheads, such that when all of the submarines are in port, there is a total of 1200 nuclear warheads between them. The other military vessel at the pier facility is Aleksandr Brykin, a transport ship for strategic nuclear missiles which can be transferred at sea onto the Typhoon class submarines. The ship's storage room holds 16 missiles, each of which carries ten nuclear warheads. There is also a ship repair bay on shore and a large floating dock, as well as a landbased storage facility for radioactive sources and solid and liquid waste. Since the facility is quite small, the waste is transferred at regular intervals to Andreeva Bay. Pier from which spent fuel is loaded from a service ship to a lorry. Radiation protection unit for the monitoring and treatment of personnel working at the facilities, Building 50. Purification facility for liquid radioactive waste (never taken into use). Used today for other purposes. Storage pool for spent nuclear fuel, Building 5. The pool was emptied and taken out of use in 1989. Three large, partially buried concrete containers for dry storage of spent nuclear fuel. Crane for transfer operations of spent nuclear fuel. An enclosed area in which containers of spent nuclear fuel are stored. Concrete bunker divided into compartments and an open area in which solid radioactive waste is stored. Underground containers for the storage of liquid radioactive waste. Storage facility for fresh nuclear fuel, Building 34. Special decontamination unit for processing of contaminated equipment, Building 4. Building for decontamination of handling equipment for nuclear fuel (never taken into use). Storage area for handling equipment. This is the Northern Fleet's largest storage facility for spent nuclear fuel assemblies, solid and liquid radioactive waste. The numbered points refer to the numbers in the text and on the map. Numerous leaks from these facilities have led to radioactive contamination of the fjord. Map 3. Overview of the different installations in Andreeva Bay. The numbered points on the map refer to the numbers in the text and on the picture. In the early 1960s, a purification plant for liquid radioactive waste was built in the tallest building shown in the photograph. The facility was never taken into operation, and today the building is in such poor condition that it no longer can be utilised. Liquid radioactive waste is stored in five underground tanks beside this building. Rightmost in the picture is Building 5 which formerly housed a storage pool for spent fuel assemblies. This draving shows Building 5 from five different angels. Spent nuclear fuel assemblies used to be stored in two storage pools inside the building. The uppermost drawing of shows the building as seen from above, while the lower shows the facility as seen from the side. The entrance for lorries carrying spent fuel may be seen to the left. The spent fuel may bee seen to the left. The spent fuel assemblies were hoisted by a crane mounted in the roof to the areas in the storage pool where they were to be stored. The cross marks the area of the storage pool where most of the fuel assemblies fell down in 1982. In addition, there is a diesel-fuelled power station, mechanical workshop, transformer station, storage for oil and diesel, and a dock facility. All of the buildings and facilities, with the exception of the concrete tanks for dry storage of spent nuclear fuel and their accompanying cranes, were built between 1960 and 1964. They are now in an exceedingly poor technical condition. 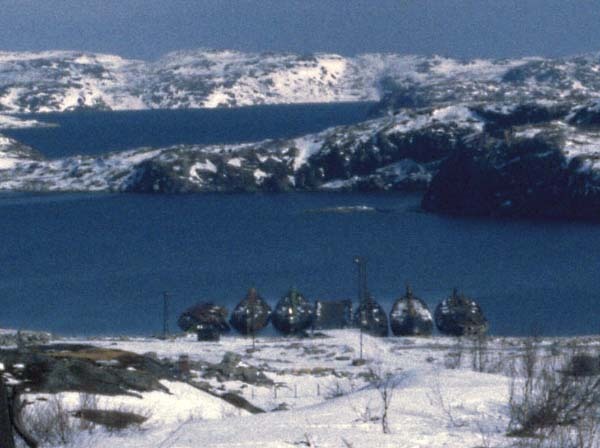 In 1986 the Ministry of Defence decided to reconstruct the Andreeva Bay installations for treatment of nuclear waste. Suggestions included building a new installation for loading spent fuel and other solid waste at the quays. (installation no. 104). None of these projects have been commenced. At the same time regulation concerning control and accounting for the waste categories are not adhered to. There are no local residents at Andreeva bay. Each shift is brought by boat from the eastern shore of the Litsa fjord. In 1993 it was found that only 64 % of the stipulated workforce was actually present. Andreeva Bay itself is not fenced in. Some of the more important storage facilities are guarded and have partial fencing. Security at the storage repositories has been strongly criticised since two fuel elements were stolen on the night of July 28th, 1993. The fuel elements were subsequently found approximately 600 meters from the storage. Two officers were later sentenced for the theft. An armed guard has now been placed at the storage for fresh nuclear fuel. At this facility there are no barriers between the fuel elements, opening for the theoretical possibility of uncontrolled chain reactions occurring. The storage has no fire alarm. A total of 21 000 spent nuclear fuel assemblies and about 12 000 m³ of solid and liquid radioactive waste are stored at Andreeva Bay. This figure also includes contaminated equipment and construction materiel still remaining in Building 5, which was the former location of a storage pool for spent nuclear fuel. Solid radioactive waste is stored in its own special area about 200 metres from the sea. The facility covers an area of 80 x 120 metres. About half of the waste is stored in a concrete bunker. The rest is stored in an open area beside this bunker. The waste inside the bunker is packed away in standard containers of 1 m³ each, whereas only a third of the waste in the open area outside has been placed into containers. Equipment of larger dimensions is stored without any particular extra protection. Altogether, just over 6 000 m³ of solid radioactive waste is stored at this particular facility. Most of it is low activity waste, but there is some that is high activity waste, such as control rods and other parts from reactors, and hydraulic components from the primary circuit pumps. The area surrounding this storage area is contaminated. At the present time, construction is under way on a new concrete structure which will most probably be used for storing solid radioactive waste. This structure is situated at the edge of the water in the southern part of Andreeva Bay. Liquid radioactive waste is stored in five underground tanks, each of which has a capacity of 400 m³. The total activity of the solid and liquid waste is at least 1 000 Ci. Most of the liquid radioactive waste being stored in these tanks at the present time consists of water from the reactors' primary circuits. Early in the 1960s, a purification plant for liquid radioactive waste was built beside Building 5; however, the facility was never taken into use and the project was shelved in 1964. Today the facility is so run down that it can no longer be repaired. There were some plans to rebuild the plant and install new equipment so that it could be utilised, starting in 1998. However, work on the project was never started, and it appears that the plans have been put away. None of the Northern Fleet service ships for liquid radioactive waste and spent nuclear fuel are based at Andreeva Bay; however, they do call in periodically, either to deliver or receive spent fuel and solid and liquid radioactive waste. Since the underground pipelines from the pier facilities to the tanks for liquid waste are no longer in operation, loading and unloading are accomplished manually, utilising tanks that are driven to and fro by lorry. The first storage facility for spent nuclear fuel at Andreeva Bay, Building 5, was taken into use in 1962. In 1973 the facility was expanded. The storage building was constructed in concrete and consists of two rectangular pools in which the inward walls are lined with steel plate. Each pool is 60 metres long, three metres wide and six metres deep with a total volume of about 1 000 m³. The volume of water in the oldest part of the facility is 600 m³ whereas the area built in 1973 has a capacity of 1 400 m³. The entire building itself is 70 metres long and 18 metres high. The facility was taken into use with the understanding that the spent nuclear fuel was to be stored in the water in the storage pools. The level of water in the pools was to be monitored from the neighbouring building in which the purification facility for liquid radioactive waste was located. Any eventual adjustments would also be made here. However, since the purification facility was not in operation, monitoring of the water level and other measurements had to be done manually. The fuel assemblies were placed alongside each other in rows of five or six and stored in containers. Each container of nuclear fuel weighed up to 350 kilograms. Up until 1973, the facility had a storage capacity corresponding to 550 of these containers. Upon the completion of the second building stage, the capacity had increased by 2 000 for a total of 2 550 containers. These had between 12 750 and 17 850 fuel assemblies, corresponding to 54 to 76 reactor cores. Later, as the Northern Fleet faced storage capacity problems for its spent fuel, the possibility of placing the containers closer together in the pools was considered. This idea was rejected for reasons of radiation safety. 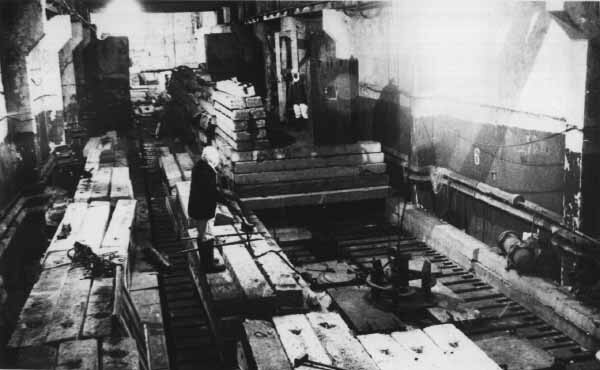 Spent nuclear fuel assemblies from all of the Northern Fleet shipyards were sent to Building 5. The containers were transported aboard Northern Fleet service ships of type 326 M and type 2020 to a special pier in Andreeva Bay. Here the derricks of the service ships lifted the holding containers up from the storage compartments and transferred them into a larger transport container. The transport container was then hoisted over to a dumper of the type BeLAZ-450 and driven up the 350 m long road up the hill and into Building 5. Unloading from the dumper took place inside Building 5 using a crane with a lifting capacity of 15 tonnes. The containers full of spent fuel were then removed from the transport container into an unloading room and transferred into a pool of water. Here it was attached to a chain hook beneath a special crane on rollers mounted in the roof of the building. This crane was driven to the designated location inside the building where the containers holding the fuel assemblies were to hang. The containers of spent nuclear fuel were suspended so that they were covered by four metres of water. This was to protect the facility's employees from receiving dangerously high doses of radiation, as well as to cool the heat producing fuel assemblies. One of the earliest problems at the storage facility was that water penetrated the containers, resulting in direct contact between fuel and water. In February 1982, the personnel of Building 5 discovered that the level of water in the second pool had dropped and a dangerous leak had developed (see the section below). It soon became apparent that the storage facility could no longer be used, and measures were taken to remove the fuel assemblies from the building. Decontamination of the area around Building 5. A new project staff was appointed to achieve these points, headed by A. Petrovsky, technical director of the Navy. It was he who had suggested using concrete tanks 3A, 2A, and 2B to store spent nuclear fuel assemblies. While work was underway to cover the first pool, in November 1982 it was discovered that the water level in the second storage pool was also sinking. In the course of one week, water was leaking out of the pool at an average rate of 10 tonnes a day. The activity of the water was 11 MBq/l (3 x 10-4 Ci/l). By December 1982, the lid over the first pool had been completed, and the rate of the leak had been reduced so that the level of water could be maintained at about three metres. The activity of the water in this first pool was 1,9 MBq/l (5 x 10-5 Ci/l). The second pool was leaking at a rate of about three tonnes a day, and here the activity was still 11 MBq/l (3 x 10-4 Ci/l). Since fresh supplies of water were continually pumped in, the water level stayed at about four metres. On February 14, 1983, a special commission form the Ministry of Defence visited Andreeva Bay. The commission approved both the measures that had been taken to stop the leak and the modification plans to turn the three concrete containers into storage tanks for spent nuclear fuel. Simultaneously it was decided that Building 5 would no longer be used to store spent nuclear fuel assemblies. In June 1983, work was started to remove the containers holding fuel assemblies from the second storage pool. At this time, the activity was highest in this storage pool. Most of the containers were transferred to concrete tank 3A, while a few more were transported to Mayak. By January 1984, all 1 000 containers had been removed. 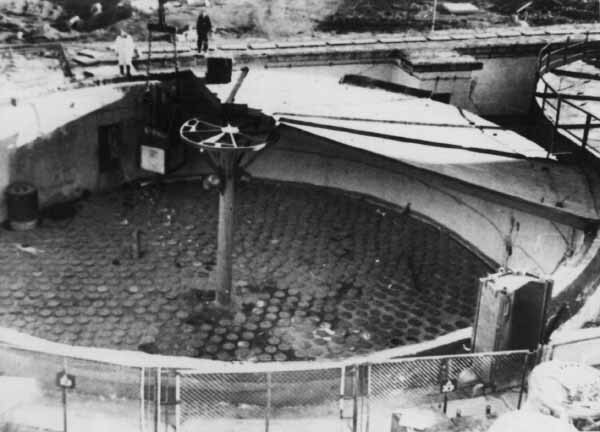 A complicating factor was that a considerable number of the fuel assemblies had fallen out of their containers and had to be raised from the bottom of the pool. About 70 containers could not be raised in the normal way; subsequently special cranes were constructed for them. A decision was made to wait two years to allow the levels of radiation to drop before removing the containers from the first storage pool. Once the first storage pool had been covered with a lid and the second pool had been emptied, the employees who had carried out the work were rewarded with an additional vacation period and engraved watches. The project leader received a bonus of 240 roubles, equivalent to one half of his monthly salary. In 1989, work was started to remove the fuel elements from the first storage pool and the remaining containers that had been left in the second pool. Both pools were emptied, and a total of 1 400 containers of fuel assemblies were taken out. A special group of experts was formed to remove the fuel assemblies that had fallen to the bottom of the pool. These specialists were drawn from a number of institutions that reported directly to Minatom, including NITI (Sosnovy Bor), VNIPIET (St. Petersburg), FEI (Obninsk) and individuals from the Navy's training centre in Sosnovy Bor. The group of 12 to 14 people was led by V. Bulygin in the task of raising approximately 120 damaged fuel assemblies from the bottom of the pool and transporting them away. The most dangerous part of the work lay in placing the damaged fuel assemblies into new containers, and it has been reported that seven or eight members of the group received radiation doses of 90 to 100 mSv (9 to 10 rem). The highest permissible annual dose is 50 mSv (5 rem). The containers were raised and taken to another storage area, most probably the storage facility for solid radioactive waste at Andreeva Bay. Upon the completion of the work, the members of the team were recognised and various honours of the Soviet Union were bestowed upon them. Some were even granted the privilege of a car. The leader of the group, V. Bulygin, was awarded the medal "Hero of the Soviet Union". The total cost of the work to empty Building 5 was about 5 million roubles (1989 figures). It has been estimated that a total of about 3 000 m³ of water with an activity of 110 TBq (3 000 Ci) leaked from the storage pools. Measurements made in 1995 showed that the brook running from Building 5 was contaminated, A total area of 1 300 m² is radioactive contamined. In the Sea outside the Andreeva Bay there have also been measured contamination. It seems likely that much of the radioactive water from the leakage was absorbed into the ground outside the building. No samples have been taken from this area. As of today, Building 5 is not in use, and it is in very poor condition. Nothing has been done to deactivate the building, and a great deal of equipment remains there. Levels of gamma radiation as high as 400 mGy/h (40 R/h) have been detected in certain areas at the bottom of the storage pools, probably due to spills of irradiated uranium from the fallen fuel assemblies. One suggestion is to cover the bottom of the pool with concrete, but this has not been done. Parts of the actual construction of the storage pools as well as some of the equipment inside the building are considered to be high and medium level waste. There have been other proposals to use Building 5 as a storage area for other kinds of solid radioactive waste since the existing storage facility at Andreeva Bay is filled beyond capacity; however, because the building is in such poor condition, this has not been done either. There are no clear plans for what to do with Building 5 in the future. Following the recommendation of specialists in the Northern Fleet's technical department, a proposal was developed to modify three large underground concrete tanks to serve as future storage for spent nuclear fuel. The three tanks had originally been designed to store liquid radioactive waste, but had never been used for such. Each of the tanks had a capacity of 1000 m³ and were located immediately below Building 5. The proposal was approved by the Northern Fleet Command, and modification costs in 1982 figures totalled 400 000 roubles. 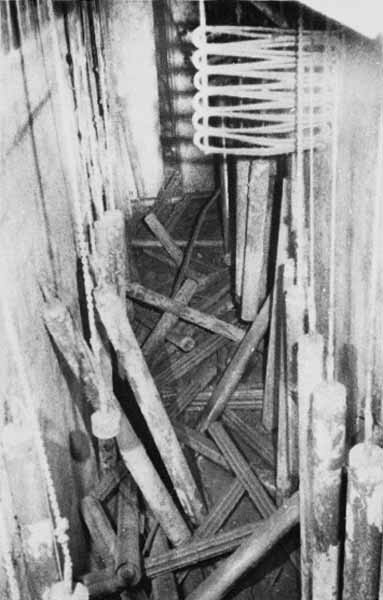 During the modification process, pipes measuring 25 to 27 cm in diameter were installed in the tanks and the spaces in between the pipes were filled with cement. A container holding seven fuel assemblies could then be lowered into each pipe This method of storing spent nuclear fuel is known as dry storage in that water is not used as a cooling agent and shield against radiation. A central ventilation system was built for cooling purposes instead. Modification of the first concrete tank (3A) began in November 1982, with the work being carried out by military personnel. 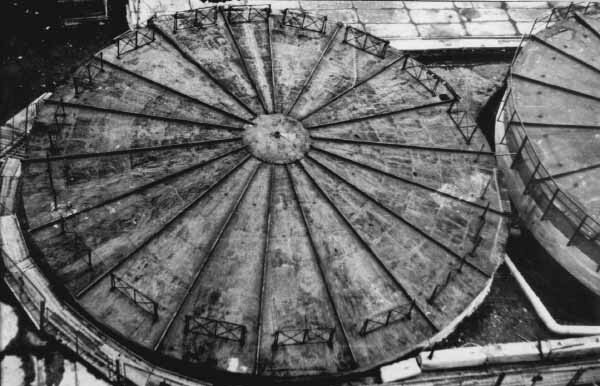 Seven months later, in June, 1983, the concrete tank was taken into use. The second and third tanks (2A and 2B respectively), were taken into use in 1985 and 1986. The first tank holds 900 containers of fuel assemblies, while there are 1 200 containers in each of the two newer tanks. This corresponds to about 21 000 fuel assemblies, or about 90 reactor cores. As of today, all three tanks are completely full. A container of spent fuel assemblies is transferred to storage tank 2A. A total of 1.200 containers are stored in this tank. The use of these tanks to store spent fuel assemblies was intended to be highly provisional and temporary. Today the tanks are in very poor condition. Photo, 23 kb. The picture to the right show a crane used for lifting the fuel assemblies. The workers operating the cranes for lifting the fuel assemblies in and out of the storage tank are shielded behind a wall of concrete and iron. An air cooling system prevents the build-up of heat in the storage tanks. The space between the storage cells containing the fuel assemblies is filled with concrete. The storage tanks 2A and 2B. These tanks were taken into use in 1985 for the temporary storage of spent nuclear fuel assemblies. Each tank stores 1.200 containers of spent fuel assemblies, and in a third tank another 900 containers are stored. These storage tanks were originally built to store liquid radioactive waste, and using them to store spent fuel assemblies was intended only as a temporary solution until a new storage facility could be built at Andreeva Bay. The lids over the tanks are in very poor condition. A large crack can be seen in the enlarged photograph. The tanks are located about 300 meters from the sea. These drawings show how spent fuel assemblies are transported to the storage tanks in Andreeva Bay. The containers are shipped on board Project 2020 - Malina class service ships from the Northern Fleet's naval bases or shipyards to Andreeva Bay (1). The service ship's own cranes are used to transfer the containers to a BeLAZ-450 type lorry at the pier (2). The lorry then drives 300 metres up the road to the storage tanks (3), where a KPM-40 type crane is used to lift the containers off the truck. These are then placed on a concrete platform alongside the storage tanks (4). Later the containers are hoisted over to the storage tank and the spent fuel assemblies lowered down into the storage cells (5). A portable crane (KPM-40) with a 30 m boom and a lifting capacity of 40 tonnes has been built to lift the containers of spent nuclear fuel in and out of the tanks. A decontamination unit and a dosimeter monitoring station were also built at this time. Undamaged fuel assemblies were transferred to the three concrete tanks from Building 5. Starting in 1984, fuel assemblies from routine submarine refuelling operations were also stored here. It was originally intended that the concrete tanks would serve as short term, temporary storage until a proper facility could be built. 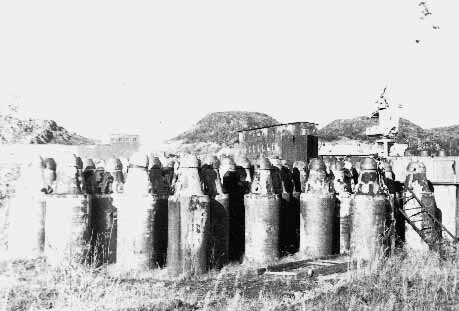 Fuel assemblies were to be stored in these tanks no more than three or four years. Subsequently, the shielding around the tanks against corrosion and external radiation had a designed lifetime of four years. Plans for a new storage facility at Andreeva Bay have existed since 1984, but at present, are only on paper. This is probably due to a lack of financing for the project. Responsibility for the building of the new storage facility rests with construction firms reporting directly to Minatom. In addition to the three concrete tanks, there is also an open area at Andreeva Bay where 52 containers of spent fuel assemblies are stored. These containers hold fuel from the very first refuelling operations carried out on Soviet nuclear submarines and were placed at their present location in 1962. In 1991, about 20 of the containers were emptied, and the spent fuel assemblies were transported to Mayak. A remaining 32 containers holding between 200 and 220 fuel assemblies are still being stored at Andreeva Bay out in the open. No decision has yet been made as to what to do with them. Accurate data on the contents is lacking. Since the containers have been exposed to the elements for almost 35 years, they are strongly corroded. The lids of some of them have cracked allowing water to enter and come into direct contact with the fuel elements. This has probably caused damage to the elements and they can not be taken for reprocessing in the usual way. The area where this fuel is stored is radioactively contaminated. At the reloading point for spent fuel elements beside the concrete tanks 2A and 2B, there are six transport containers type TK-11 (type 6), with spent fuel elements. These have not been unloaded because there is no spare storage capacity for them. There are 32 containers with a total of 200-220 spent fuel assemblies being stored in an open, unshielded area at Andreeva Bay. These containers have been stored in this manner since 1961-62, and the containers are in very bad condition. The whole area surrounding these containers is radioactively contaminated. A close-up photograph of the containers that are being stored outside shows large cracks in several of the container lids. During the six months of winter, these containers are covered by ice and snow. Most of the fuel assemblies inside the containers are probably damaged and cannot be transported away from the area using standard equipment. Far more technical information about each particular fuel assembly would be required in order to estimate the total amount of 235U in the spent nuclear fuel assemblies that are stored at Andreeva Bay. Nonetheless, it is possible to give some estimates on the basis of the available information. Fuel assemblies equivalent to about 90 reactor cores are stored in the three storage tanks. It has been stated that there is about 50 kg of 235U in each reactor core of first generation Russian submarines, while the reactor core of a second generation submarine holds about 70 kg of 235U. There is about 115 kg of 235U in the reactors of the third generation submarines. The total uranium content of a 2nd or 3rd generation reactor is between 300-350 kg. It is reasonable to assume that most of the fuel assemblies now stored at Andreeva Bay are from second and third generation submarines, since most of the first generation nuclear submarines were decommissioned towards the end of the 1980s. These vessels were laid up with the nuclear fuel remaining in the reactors. Owing to a lack of capacity at the intermediate storage facilities on the Kola Peninsula, the Northern Fleet has prioritised refuelling the operational submarines at the cost of defuelling those that have been taken out of service. The naval base Vidyaevo consists of two bases: Ara Bay and Ura Bay. The town of Vidyaevo itself with its 20 000 inhabitants lies on the eastern side of the Ura Bay, six kilometres north of the actual village of Ura Bay. The area has served as a base for diesel powered submarines since the beginning of the 1960s, and in 1979 it became a base for nuclear submarines too. Map 4. Vidyayevo Naval Base and Sayda Bay. In the 1980s, Ara Bay was a relatively large navy base serving nuclear submarines of all three generations; however, in recent years, the base has decreased in importance. There are 14 nuclear submarines laid up at the base at this time, nine of the Project 675 - Echo II class, and five of the Project 670 - Charlie-II class. These submarines between them account for 23 naval reactors, all of which still contain their fuel. The remaining active submarines that are based here are of the Project 971 - Akula class. The base at Ara Bay is one of the most poorly equipped bases of the Northern Fleet. 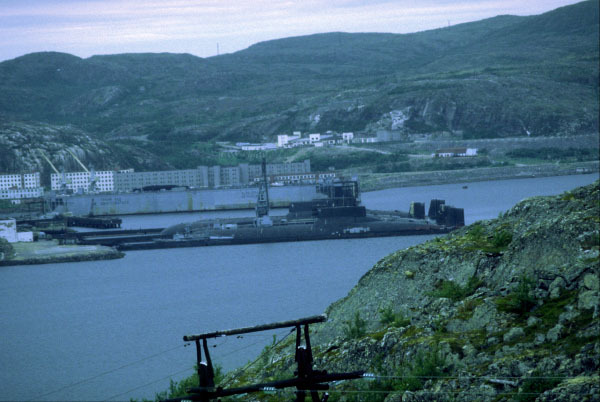 The nuclear submarine K-192 (formerly K-131) which suffered a reactor accident in June 1989, was laid up at Ara Bay until 1994. Since it was in danger of sinking there at the pier, it was moved to Shipyard No. 10 Shkval at Polyarny. However, 74 TBq (2 000 Ci) was released to the sea in connection with the accident, and an area of 1 km² in Ara Bay was contaminated by radioactivity. Three tunnels originally intended to conceal nuclear submarines, have been blasted out at the naval base in Ara Bay. These tunnels are 30 meters in diameter, and each one measures 400 meters in length. None of them has been completed. For many years there have been plans to use these tunnels to store reactor compartments from dismantled submarines. The use of the tunnels was intended as a temporary measure until a permanent repository for radioactive waste could be established in north-western Russia. A storage period of about 80-100 years for up to 100 reactor compartments is considered a realistic possibility; however, at the present time, there are no available funds to finance this project. (For further information, see Chapter 6 which discusses the decommissioning of nuclear submarines). 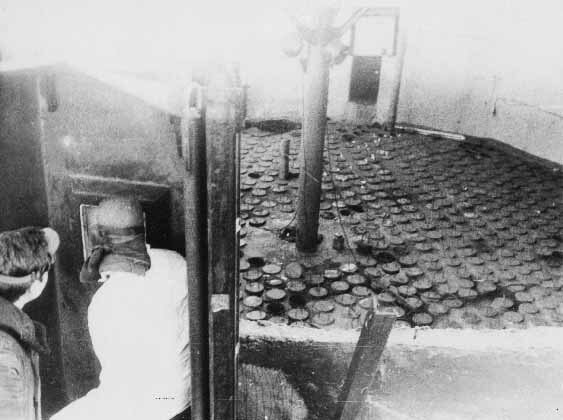 A Nurka type reactor is also stored at Ara Bay still containing its nuclear fuel. This type of reactor was intended to be installed in a diesel-powered submarine. It is not known whether or not the reactor was ever actually used. It is believed that there is also a smaller storage area at Ara Bay for solid and liquid radioactive waste. In addition there is a storage tank of 3 m³ in volume that is used to collect liquid radioactive waste from submarines. The base at Ura Bay is used for diesel submarines and a few smaller surface vessels. Sayda Bay is a former fishing village that was annexed as a military area in 1990. Its former inhabitants were moved out, and the area is now used for storing hulls and reactor compartments from nuclear submarines. In April 1995, twelve submarine hulls were tied to three different piers in Sayda Bay. The water is 20 m deep at the piers. The oldest pier is over 30 years old and was built for the local fishermen. According to base authorities, this pier could sink at any time. Many more piers have been planned for Sayda Bay, but the project has been halted owing to a lack of funds. According to Northern Fleet specialists, the reactor compartments can be stored at the piers for a period of up to ten years. After that they should be placed into dry docks and transported to a storage facility where they will not come into contact with water. Otherwise they should be dismantled. This small fishing village at Sayda Bay has been annexed, and submarine hulls and reactor compartments are stored at three piers. Reactor compartments that have been cut out from decommissioned submarines at the naval yards in Severodvinsk and Nerpa are towed here to Sayda Bay. Today there are 12 reactor compartments tied to the piers here, but this figure is expected to increase in conjunction with the ongoing decommissioning of numerous other nuclear submarines. At the present time, there are 12 reactor compartments at the three piers. Four of them are from the submarines K-216, factory no. 424 (Yankee class) with eight compartments; K-415, factory no. 451 (Yankee) with three compartments; K-241, factory no. 462 with three compartments, and K-463, factory no. 915 (Alfa) with pontoons welded on both front and back. Four of the twelve compartments were towed to Sayda Bay between the summer and autumn of 1994. The reactor from the submarine K-463 was towed to Sayda Bay from Severodvinsk at the end of the 1980s. There are 20 tons of solid radioactive waste stored in the reactor compartment which was filled in Severodvinsk. 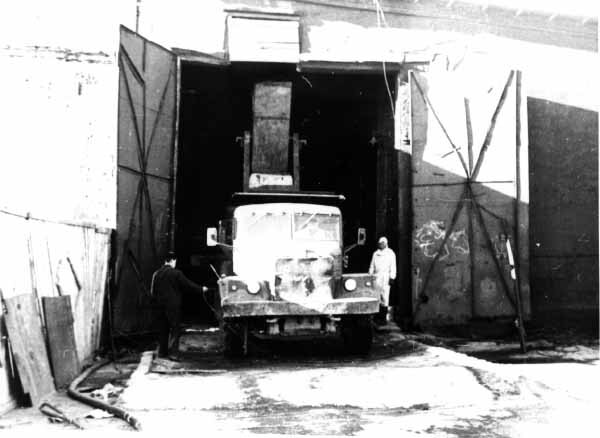 The reactor compartment was washed prior to being towed to Sayda Bay in 1994. Indeed, all of the reactor compartments presently stored at Sayda Bay have originated in Severodvinsk, as will those that come here in the future. In the fall of 1995, three new reactor compartments were scheduled to be towed to Sayda Bay. The two first reactor compartments were to be towed from Severodvinsk and came from the submarines K-228 and K-444 (both Yankee class). Both of them have a three-compartment reactor unit The third reactor compartment from the Victor-I class submarine K-481, was scheduled to be towed from Nerpa Shipyard. There are two pontoons mounted on this reactor compartment to keep it afloat. One additional reactor compartment from Nerpa Naval Yard is expected at Sayda Bay during 1996. This reactor comes from the submarine K-479 (Charlie). A submarine hull from Gadzhievo is also due to be transported here. The nuclear fuel has been removed from all of the reactor compartments that are laid up at Sayda Bay; however, over the course of 1996, the reactor section of a Project 705 - Alfa class submarine is due to be towed to Sayda Bay. In this case, the fuel will remain on board the submarine. Monitoring of the submarine hulls and the reactor compartments ability to float is carried out by Navy personnel residing at Sayda Bay. In the event that a hull or reactor section sinks, it is their responsibility to report this to the Northern Fleet rescue service. The rescue service then sends a tug and attempts to pull the reactor compartment/hull up onto land. Monitoring the levels of radiation at the piers is undertaken by the Radiation Safety Service from Gadzhievo Naval Base. The maximum permissible level of radiation on the outside of the reactor compartment is set at 200 mR/h. There are no reports of radiation at higher levels than this being measured outside the reactor compartments. The naval installation at Gadzhievo consists of two bases. One is located in Sayda Bay at the town of Gadzhievo; the other one is situated at Olenya Bay. The facility at Gadzhievo (also known as Skalisty) was taken into use in 1956 as a base for diesel-powered submarines. Nuclear submarines have been stationed here since 1963, and at present, submarines of Project 667 BDRM - Delta-IV class, Project 667 BDR - Delta-III class and possibly a few submarines of Project 971 - Akula class are based here. Recently a new facility for removing spent nuclear fuel was built at the base, and there are six laid up submarines here. Gadzhievo has its own radiation safety service with floating containers for liquid radioactive waste at its disposal. In addition, 200 m³ of liquid radioactive waste and 2 037 m³ of solid radioactive waste are stored in other facilities. Gadzhievo has a facility for removing spent nuclear fuel from submarines. The service ships PM-12, PM-50, PM-78 and PM-128 are often based here in connection with this work. The second naval base facility is located west of Polyarny in Olenya Bay. There are nine submarines based here, two of Project 667 BD - Delta-II class, and seven of Project 667 BDRM - Delta IV class. Four of the Northern Fleet mini-submarines from Project 1851 - X-ray class and Project 1910 - Uniform class are also based at Olenya Bay. This naval facility in Gadzhievo serves as a base for Delta and Akula class submarines. This navy base is one of the largest in the Northern Fleet. The submarines pictured here are Delta-I and Delta-IV class vessels. Severomorsk serves as the main base and administration centre for the Northern Fleet. The city lies 25 km north of Murmansk on the eastern side of the Murmansk Fjord, and has a population of 70 000. The Northern Fleet's large surface vessels are based here, of which two are nuclear-powered Project 1144 - Kirov class battle cruisers: Admiral Ushakov and Admiral Nakhimov . The newest nuclear-powered battle cruiser Pyotr Veliky is scheduled to be delivered from the shipyard in St. Petersburg over the course of 1996. Severomorsk has no permanently stationed nuclear submarines. Severomorsk is situated at the Murmansk Fjord and is the Northern Fleet's main base. This closed city has about 70.000 inhabitants and is located about 20 kilometres north of Murmansk. Most of the Northern Fleet's surface vessels are based here, including the nuclear powered battle cruisers. None of the nuclear submarines are regularly based at Severomorsk. The ship repair factory SRZ-82 is located in Safonovo, a rural town also in the Severomorsk area. This factory has a number of floating docks used in the repair of nuclear submarines and surface vessels. The area's largest floating dock is located here, and the factory undertakes the repair of the largest Northern Fleet submarines, including the Project 941 - Typhoon class. Shtyukozero, another rural town located about 8 kilometres north east of Severomorsk, has a large repository for missiles, including missiles with nuclear warheads. In 1984 there was a powerful explosion here followed by a fire in which a large number of missiles were totally destroyed. The fire was rapidly extinguished and did not spread to the nuclear missiles. Gremikha is the easternmost of the Northern Fleet naval bases on the Kola Peninsula, and lies about 35 kilometres east of the mouth of the Murmansk Fjord, just at the borderline for an ice-free harbour during the winter months. This base is also known as Murmansk-140 and Iokanga. Other places with direct connection to the base are Yagernaya and Ostrovny (residential quarters for the submarine officers). The only access to the base is either by ship or by helicopter, and during winter storms, the base is completely isolated. The pier facilities are located on the mainland inside the Iokagansky islands Chaichy, Vitte, Salny, Medvezhy and Pervy Osuzhnoy. There is a natural canal 500-600 meters wide between the islands and the mainland. The total length of the pier facilities at Gremikha is 6 770 meters. Map 5. The naval base Gremikha lies easternmost on the Kola Peninsula, and there are both active and laid up submarines here. There is also a storage facility for spent fuel assemblies and for solid and liquid radioactive waste. Gremikha was first settled in the 1800s. In the 1930s, it was the location of a prison camp for political prisoners. Ever since the outbreak of World War 2, it has been a naval base, although it did not serve as a submarine base until after the war when conventional submarines were posted here. The first Russian nuclear submarine (K-3) visited Gremikha in July 1962 on its return from the North Pole, and was received on its arrival by the General Secretary for the Central Committee of the Communist Party, N. S. Krushchev. In 1968, a squadron of nuclear submarines of the Project 658 - Hotel class was posted to the base at Gremikha, and in 1974, a group of Project 667 A - Yankee class submarines was added. With the arrival of the Yankee class submarines, the base was developed further, including a new quay facility. A floating repair yard was also constructed for the nuclear submarines at the base. By the 1980s, the base had a population of 30 000; this figure has fallen by about 10 000 in more recent years. Today, there are a few operational nuclear submarines based here plus another 15 that have been taken out of service. Four of them are Project 627 A - November class; one is a Project 658 - Hotel class, and eight are of the Project 671 - Victor class. The nuclear fuel has not been removed from any of the vessels; thus there are a total of 26 reactors still containing their nuclear fuel that have been laid up at Gremikha. Tunnels have been built in Gremikha for the purpose of concealing submarines, but it is not known whether or not these tunnels have been taken into use. Gremikha has one storage facility for solid radioactive waste. The facility measures 15 m x 20 m and is situated right beside dry dock no. SD-10. Containers and other contaminated equipment are stored here in the open. Certain of the radioactive contaminated items that are stored here are so large that they cannot be transported away with the available equipment; subsequently, these items have not been packed in with any protective covering or shielding around them. Nor is the storage area secured against run-off. Liquid radioactive waste is stored on land in underground tanks. These tanks were originally built as part of a facility to process liquid radioactive waste, but just like a similar facility in Andreeva Bay, this facility has never been utilised. The storage tanks are constructed of concrete covered on the inside with stainless steel and do not satisfy present day requirements or standards. Nonetheless, a total of 2 000 m³ of liquid medium level radioactive waste with an activity of 370 kBq/l (10-5 Ci/l.) is stored in these tanks. The tanks have been set inside a number of buildings, and so far, there are no reports of any leakage from them. In addition to the tanks, liquid radioactive waste is also stored in a service ship of the Project 1783 A - TNT (Vala class) as well as in some PEk-50 type floating tanks. There is little in the way of liquid radioactive waste being generated today since the nuclear submarines are no longer refuelled at the base. Gremikha is the only Northern Fleet naval base where liquid metal cooled reactors can be refuelled and the spent fuel taken from them is stored on base. Spent nuclear fuel from pressurised water reactors is also stored here. Spent nuclear fuel assemblies are stored in Gremikha at three different places, but all three are connected to the dry dock SD-10. During World War 2, this dock was blasted into the mountain from the seaward side. The first generation of nuclear submarines was refuelled here, but was later rebuilt to accommodate refuelling activities for the Project 705 - Alfa class submarines with their liquid metal cooled reactors. There are two cranes at the dock with a lifting capacity of 10 and 75 tons, respectively. On the inside, the dock is covered with concrete and a roof has been built over it. The water in the dock can be pumped out once the submarines have come in. Repair work and refuelling activities can be undertaken once the water has been pumped out. The cranes are sufficiently long such that the spent fuel removed from the reactors can be transferred directly to the fuel storage tanks. The entire area around dry dock SD-10, including the storage facilities for solid and liquid radioactive waste are known as "Object 925". The first storage facility for spent nuclear fuel is a storage pool, and is called "Building 1". Construction of the facility began in 1960, and it was here that spent nuclear fuel from the pressurised water reactors of the first generation of nuclear submarines, Project 627 - November class was stored. The facility has been divided into four separate pools with a common shielding around all of them. These four storage compartments are made of concrete, and are covered with metal on the inside. Each of the compartments are 68.44 m³ and were intended to hold two reactor cores. The total capacity of the four compartments was approximately 1 500 fuel assemblies, corresponding to a total of eight reactor cores. Unlike Building 5 at Andreeva Bay, where five to seven reactor cores were stored together, the reactor cores at Gremikha were stored separately. The fuel assemblies were attached to a console and hung down into the water. The storage pools were built underground and are 4.8 meters deep. 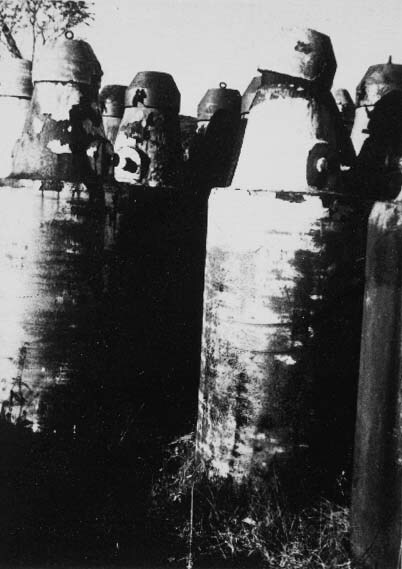 Each of the fuel assemblies weighed 20 kilograms, and were stored underwater with a minimum coverage of 3 meters of water over the top of each one. When water leakage from the storage pools was discovered in 1984, the spent nuclear fuel assemblies were removed and transported on Northern Fleet service ships to Murmansk. Here they were transferred to trains and forwarded to Mayak. However, only three of the pools were completely emptied. Ninety five damaged fuel assemblies were transferred to the fourth pool where they remain in storage today. The second facility for spent nuclear fuel assemblies is an outdoor one without any form of protective covering or shielding. There are approximately 110 type TK-11 (type 6) containers being stored here holding an approximate total of 700 spent nuclear fuel assemblies. The containers have been set down quite haphazardly in an open area surrounded by a broken concrete wall. One of the containers is in very poor condition, having been outdoors and withstanding the elements for over 30 years. The containers hold spent nuclear fuel from the earliest submarine refuelling activities at Severodvinsk early in the 1960s. Today, there are no service ships with the specially designed storage hold necessary to transport the spent fuel away from Gremikha. The storage facility is situated about 30 m from dry dock SD-10. The third storage facility for spent nuclear fuel contains reactor cores from submarines with liquid metal cooled reactors. In the middle of the 1960s, two reactor cores from the Project 645 ZhMT) submarine K-27 were placed in the innermost parts of dry dock SD-10. These reactor cores had been removed from the submarine at Severodvinsk and transported to Gremikha. The two reactor cores are still in concrete containers in storage facility 2B today Later it was decided to defuel submarines with liquid metal cooled reactors at Gremikha. As a result of this decision, dry dock SD-10 was modified early in the 1980s from a facility that specialised in the refuelling of first generation submarines to one handling the defuelling of submarines with liquid metal cooled reactors (Alfa class). As part of the modifications, storage facility 2B was enlarged and a new storage tank, 1A, was built. Today the total capacity of the two storage areas is 10 reactor cores, two in storage facility 1A, and eight in storage facility 2B. The procedure for removing spent nuclear fuel from liquid metal reactors was different to that used when handling fuel from submarines with pressurised water reactors. 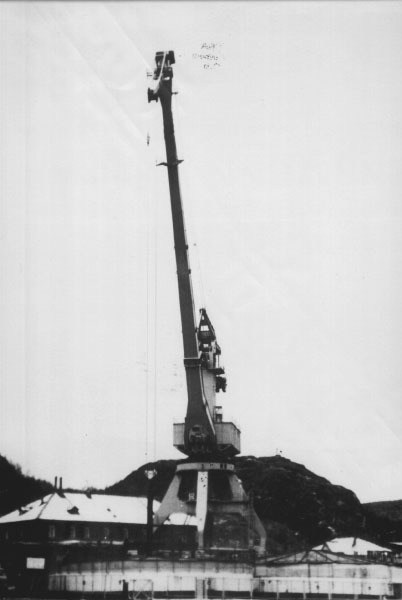 A container was hoisted out over the open reactor compartments of the submarines (Project 705 - Alfa class.) The reactor core was then heated up with steam, and the fuel assemblies were drawn up into the container using vacuum pressure. 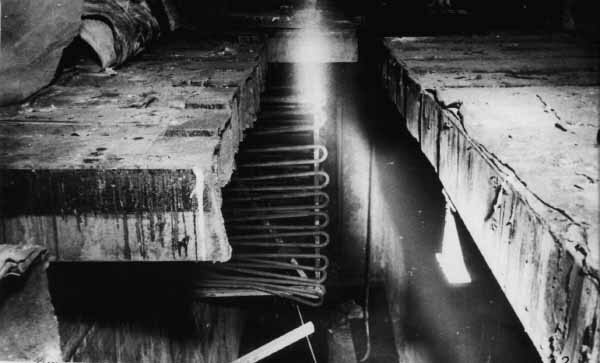 The container would be left hanging over the reactor compartment for a time until the liquid metal (a lead bismuth mixture) that had been drawn up with the fuel assemblies could run down into the reactor again. After that, the container was sealed and transferred to storage facility 1A with the help of a 75 ton crane. After two months of storage in storage tank 1A, the container was transferred to storage facility 2B. As of today, four submarines of the Project 705 - Alfa class have been defuelled at Gremikha. These four reactor cores, along with the two from K-27, are being stored in storage facility 2B. Hence there is a total of six reactor cores in Gremikha from submarines with liquid metal cooled reactors. There are also three more Project 705 - Alfa class submarines here still containing their nuclear fuel (one active, and two inactive). It is not known what will be done about the nuclear fuel that remains on board the vessels. Furthermore, on December 21, 1994, it was decided that the reactor compartment from the submarine K-64, fabrication no. 900, should be stored at Gremikha. This reactor section is filled with furfurol, and it is impossible to remove the fuel from it. Today, neither refuelling nor defuelling of nuclear submarines can be undertaken at Gremikha because the dry dock SD-10 is leaking, and the equipment in the dry dock is worn out. There were plans to repair the facility in October 1994, but nothing was done because the work team was constantly drunk. Work is now in progress to build transport containers suitable for fuel assemblies from liquid metal cooled reactors. These will be used for transport from Gremikha in 1998. Containers of spent fuel assemblies were transported to Building 5 from the quay facility 350 meters below i BeLAZ-450 type lorries like the one pictured. Here the lorry is going through the dosimeter check at the entrance to Building 5. The container may be seen on the flatbed of the lorry. Overview of the inside of Building 5 in the area where there used to be two storage pools for spent fuel assemblies. The photograph was taken during clean-up work following the leaks of the 1980s. Here a fuel assembly is hoisted up from the bottom of the pool. All equipment used during clean-up is radioactively contaminated, and the entire building itself must now be considered as radioactive waste. In this picture parts of the damaged lid over the storage pool in Building 5 are shown. The pipes beneath the cover were a part of the pool's cooling system. The cooling system was necessary for controlling the build-up of heat in the water around the fuel assemblies. The picture shows damaged fuel assemblies at the bottom of the storage pool in Building 5. The containers, which hung from chains, fell down and parts of the fuel rods were damaged against the pool floor. The floor of the storage pool has been partially covered by concrete in the time since this picture was taken. Intense radiation (400_mGy/h / 40_R/h) is still being measured in this area of Building 5 owing to radioactive contamination of the pool floor, and these parts of the storage pool must be treated as high level waste. In February 1982, it was discovered that the water level in one of the four storage pools for spent nuclear fuel assemblies in Building 1 had dropped. (At this time, fuel assemblies from the first generation of nuclear submarines were being stored in the pool.) Although more water was immediately poured into the pool, there was an increased activity in the water which was running out the dry dock SD-10, as much as 370 Bq /l (10-8Ci/l). Upon closer inspection it was discovered that there were about 30 tons of radioactive water leaking out of storage pool no. 1. The decision was made to cease using the facility and to transport all of the fuel assemblies away from Gremikha, all except approximately 100 fuel assemblies which had been destroyed. These were transferred to storage pool no. 2 which was in better technical condition. At this point, fuel assemblies from four reactor cores were being stored in the storage pools. After the pools had been emptied, it was asserted that the leak had been caused by a crack in the pool which had come as a result of defective welding in one of the consoles that held the spent fuel elements. Examinations of the other pools indicated that a number of the fuel assemblies had cracked. Each assembly weighed 20 kilograms, and the task of removing them from the storage pools was far easier than the clean-up of storage building no. 5 at Andreeva Bay. The 95 fuel assemblies that had cracked were transferred to storage pool no. 2 where they remain today. There are no existing plans for how to store or transport them in the future. The condition of storage pool no. 2 is now critical, for there is a considerable collection of fission products in the fuel assemblies. The contaminated ground in the dry dock has been collected and packed into containers. These containers are now stacked in the same open area where the solid radioactive waste is being stored. Further use of the storage facility at Gremikha is presently prohibited under a directive from the Ministry of Defence's Department for Radiation Safety. Storage pools no. 1, 3 and 4 are now thoroughly dry, but they have not been decontaminated.